In the turbulent political atmosphere of 1930s Palestine, political cartoons were much more than commentary on current affairs. In 1930s Jerusalem, a young boy walks to school through the narrow, stone paved streets of the Old City. Every morning, as he reaches Damascus Gate, he passes a group of men gathered at a local coffee shop to listen to the latest news. 1. Nusseibeh, Hazem. Interview by Thoraya El Rayyes & Ibrahim Tarawneh, Amman (2015), sound recording. 3. Khalidi, Rashid. The Iron Cage: The Story of the Palestinian Struggle for Statehood. Beacon Press, 2007. 4. Shaw, Sir Walter Sidney. Report of the Commission on the Palestine Disturbances of August, 1929: Evidence Heard During the 1st [-47th] Sittings, HM Stationery Office, 1930. 5. Sufian, Sandy. “Anatomy of the 1936–39 Revolt: Images of the Body in Political Cartoons of Mandatory Palestine”, Journal of Palestine Studies 37, No.2 (2008). 1. Shaw. 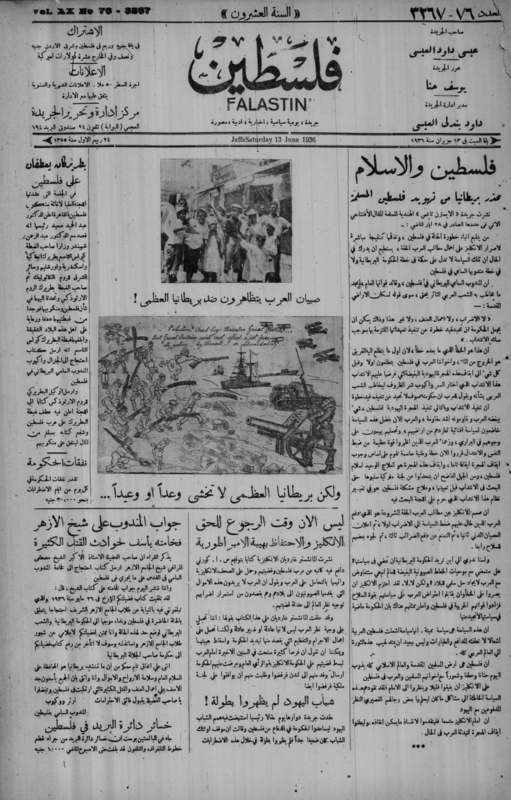 Report of the Commission on the Palestine Disturbances. 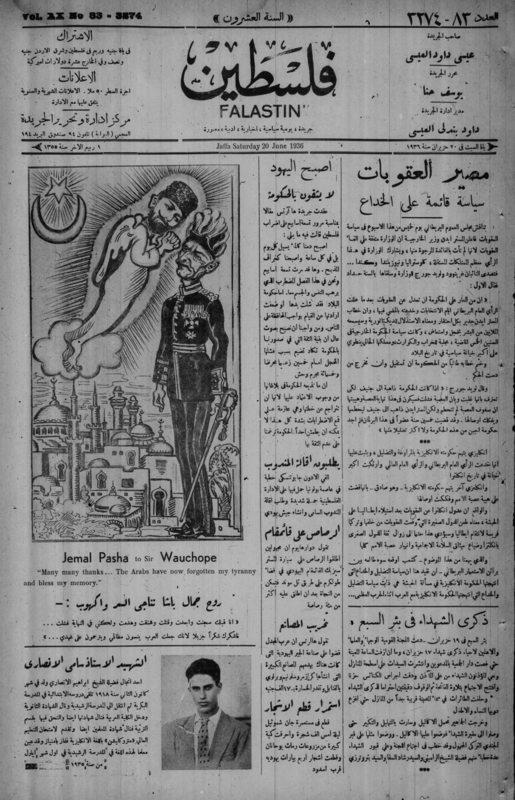 Political cartoons always appeared on the front page of these newspapers, providing sharp critiques of political negotiations, tactics and economic developments.1 Yet the woman who drew the most widely read cartoons in 1930s Palestine remains shrouded in mystery. All we know is that she was a Christian from Eastern Europe, and that the owner of the newspaper Falastin, ‘Isa Daud al-‘Isa, would think up the ideas for the cartoons and ask her to draw them. Her story was told over sixty years later, in an email from ‘Isa’s son to the American academic, Sandy Sufian, just a few years before the son passed away. Had it not been for this email, this mysterious woman would have disappeared from history entirely. 1. Sufian, Sandy. 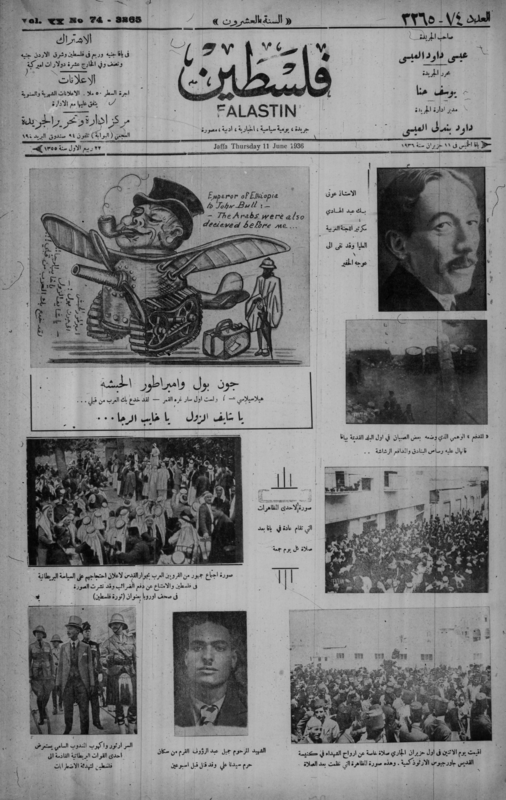 “Anatomy of the 1936–39 Revolt: Images of the Body in Political Cartoons of Mandatory Palestine”, Journal of Palestine Studies 37, No.2 (2008), p. 25. Though they may seem simple and direct, some of these cartoons contained multiple layers of symbolism. 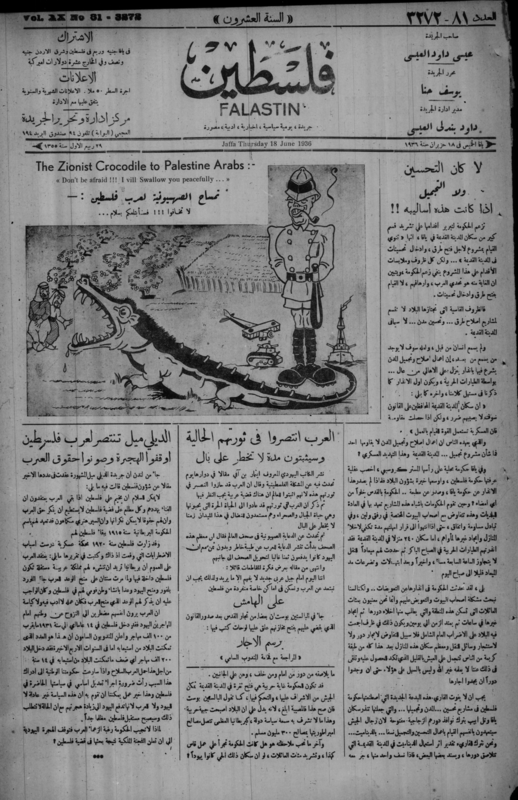 The June 1936 Falastin cartoon titled The Zionist Crocodile to Palestine Arabs tells a multifaceted story about the colonization of Palestine. The bug-eyed crocodile salivates as he prepares to devour Arab fallahin and their citrus groves, his tail emerging from the sea like a ship’s ramp. He embodies two key strategies of early Zionism: gaping jaws representing the colonization of indigenous land through Zionist land acquisition, and scaly tail alluding to the arrival of tens of thousands of European settler colonists to Palestine by ship. 2. Tamari, Salim, and Issam Nassar. The Storyteller of Jerusalem: the Life and Times Wasif Jawhariyyeh, 1904-1948, Olive Branch Press: 2013. 3. Sufian. “Anatomy of the 1936–39 Revolt,” p. 30. At a library in Beirut, a middle-aged man puts on a set of rubber gloves, takes a small reel out of the archive and attaches it to the microfilm reader. The reader is a clunky grey machine that looks something like a PC from the 1980s. The Beirut-based library of the Institute of Palestinian Studies is one of the few places where these caricatures have been preserved, but sadly much else from this period has been lost forever. Caught up in the fervor of revolt and faced with harsh British repression, it seems Palestinian revolutionaries and their supporters had little time to document their stories and preserve their history. Much of what had existed was lost a decade later in the Nakba, as Palestinians fled their homes in the face of danger from Zionist militias.1 In these rare drawings, we see some of the few remaining images that tell the story of an anti-colonial consciousness awakening in British Mandate Palestine. 1. Azoulay, Ariella. "Photographic Conditions: Looting, Archives, and the Figure of the" Infiltrator", Jerusalem Quarterly, No. 61 (2015): 6. Ibrahim Tuqan and the making of "Mawtini"